At Drinktec 2009 SMI presented, in worldwide preview, the new APS 3000 palletiser. 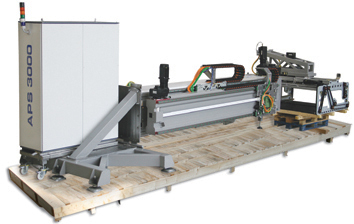 SMI palletising systems set a new standard in the industry of robotic palletisers. Smipal APS series is the outcome of an intense activity of research and innovation, which allowed producing technologically advanced systems capable of providing each user with the fittest packaging solutions according to his specific needs. The model displayed at the exhibition, the APS 3000, is a single-column system based on two Cartesian axes motion. The vertical axe is composed of a hard-set vertical column along which a horizontal beam runs on recirculating-sphere guides. The horizontal axe of operation is made up of the beam, along which, again on recirculating-sphere guides, the grip-head holding arm moves. The grip-head picks the pack layers up from a conveyor belt positioned at waist height and, with swift and precise movements, deposits them on the pallet in the desired spot. The beam's vertical motion and the grip-head holding arm's horizontal motion are driven by brushless motors, which ensure perfect trajectories during the whole palletisation process. The APS 3000 system's functions can be widened by adding an optional device enabling the grip-head to rotate around its own vertical axe. The automation and control of the machine's key functions rely on a PC-based system called MotorNet System®, developed by Smitec division, which can be set with either a SERCOS interfaceTM fieldbus or a CAN Open interfaceTM fieldbus and can run on an optical fiber communication backbone network. The employment of this technology within palletisation systems, which are characterized by repetitive actions, turns into higher reliability, fewer maintenance operations and lower operating costs. The machine management is extremely easy, thanks to a simple and user-friendly man-machine interface console, which is equipped with advanced graphic touch-screen display and a complete array of utilities for real-time machine diagnosis and technical support. The Smipal APS 3000 is equipped as a base supply with the brand-new dedicated "safety PLC", which allows to program all safety systems in a flexible, reliable and efficient manner. The safety PLC monitors the accurate functioning of all the safety devices of the palletisers and integrates their performances. 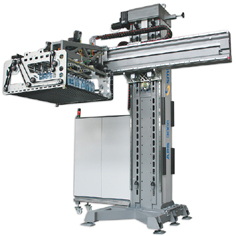 This system enables to dramatically reduce machine downtimes, both in an emergency and during the pallet loading operation, the cardboard sheet loading operation, etc., thanks to dedicated solutions for each area of intervention. Maintenance operations are simple and easy, and the palletising systems upgrade to future safety rules will be quick and trouble-free, since just an upgrade of the PLC software will be required. 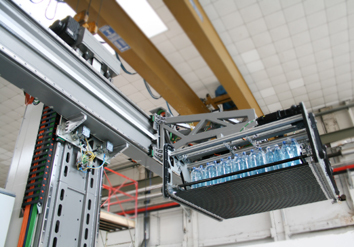 Each single module composing the palletiser is conceived as an independent unit and connected through a network to the central body. Therefore the APS 3000 is set in motion immediately since each module is assembled, pre-cabled and tested at SMI production plant, thus minimizing assembly and start up operations at the customer's site. The whole system can be easily "disassembled", conveyed or stored in a small room, and later "re-assembled" and set in motion again in less than 3 hours. The mechanical simplicity, the employment of robot-based components and the structural optimization allow a remarkable reduction of the maintenance costs and of the energy consumption, as well as the extension of the machine life cycle. For further information about the new APS series we invite you to contact SMI sales department.